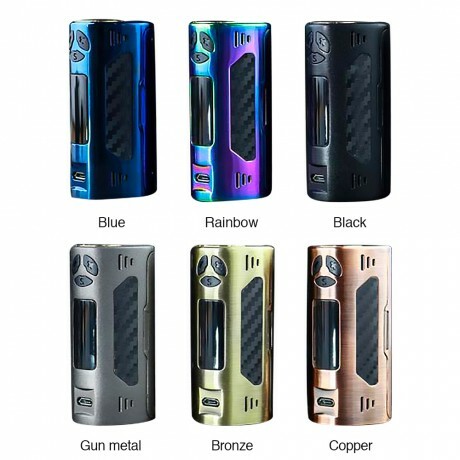 Say hello to TRIGGER, an ergonomic and powerful TC box mod from DOVPO. Made of high quality zinc alloy, TGIGGER feels excellent in hand. Powered by dual 18650 batteries, it can fire up to 168W with high performance VV/VW/TC modes. Focusing on user experience as well as performance, it adopts the individual "SET Button" and super sophisticated drop-down menu, making the operation easier and safer than ever before. Together with 0.96-inch OLED screen and Micro-USB charging port for 2A quick balance charging, it will bring your vaping experience to a new level. Moreover, it’s a device that's 25mm-atty compatible, another huge pro for all the users as well.